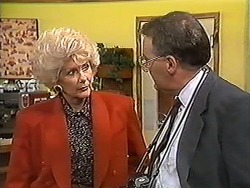 Diane warning Helen to leave her inheritance alone. 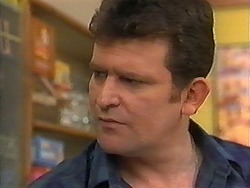 Helen tells Derek she has to leave, he thinks there is something wrong but Helen dashes off. Des and Harold arrive for a meeting with Paul. 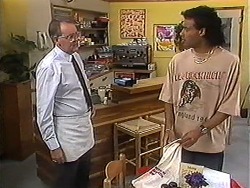 The Coffee Shop lease is up for renewal and someone has offered more money per week, Des and Harold are outraged. 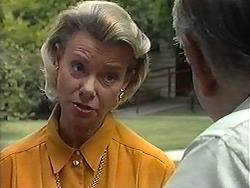 Caroline steps in and calms things down, she says at least Des and Harold know about the other offer. Helen is telling Dorothy about Diane's accusations, Helen says she can see Diane's point, Dorothy tells Helen to stand up for herself. HELEN: You're one of a kind, Dorothy. Matt and Des are getting ready for dates, Melanie then comes out dressed in pyjamas, she's ill and won't go out, she says she will be in bed all night, she then comes out again as she forgets her vitamin tablets, Matt is worried she will spoil the night. Des is upset about the Coffee Shop rent but Matt tells him to think positively. 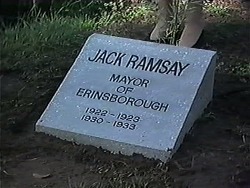 The Mayor has rung Madge about the Jack Ramsay Memorial Fountain, it's going to be demolished but a plaque and a tree will replace it, Madge is going to unveil the new plaque. Harold is distracted and ignores Madge; he is worried about The Coffee Shop. 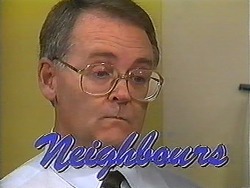 MADGE: Paul Robinson is Paul Robinson. Call it an affliction. 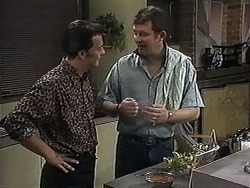 Eddie tells Harold to cut costs; he then becomes worried when Harold says his job might have to go. Harold is worried that he won't get another job if they have to give up the shop. Matt and Des are having a drink while Melanie sneaks out of her room again, the boys are not happy with her, she then comes out again for her magazine! Des and Matt have been stood up by their dates, Melanie has been eavesdropping and notices the answer machine has a message on it; it's the guy's dates cancelling. Melanie tries to console the boys. MELANIE: You must feel like such losers. Caroline thinks Paul should keep The Coffee Shop as it is, Melanie then asks Paul for leave so she can go on the cruise, Paul says it's fine until he hears it's next week! He says Melanie can only go if she finds a replacement and it must be female! 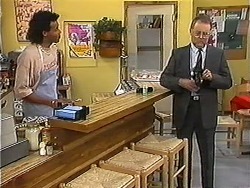 Eddie wants to spread some lies about the state of the Coffee Shop; Harold won't lie though just as Madge enters. 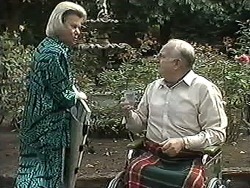 She pulls Harold aside for a quiet word, she thinks Eddie should find somewhere else to live, Harold's not sure if they can sack him and leave him homeless. Eddie heads off to the bank. Madge makes her speech to around seven people including Helen, Dorothy and Harold! Dorothy says she is pleased the Fountain is gone, Helen calms down Madge. Meanwhile, a dog has taken a shine to the plaque! HAROLD: I won't do anything unethical. EDDIE: How can you fight Paul Robinson if you are ethical? Helen is visiting Derek again, she has flowers for Derek. 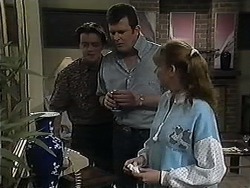 Helen wants Derek to discuss the Scholarship with Diane; he doesn't want to discuss it though and says Helen is his only choice, Helen tentatively agrees to do it. Melanie is interviewing temporary receptionists; Paul is very impressed with the array of young blonde females in the reception area! Des is worried that they made no profit today, Eddie banked 300 dollars but Harold gave him 500, Harold thinks maybe Eddie has stolen the money!